Is the partial derivative of fast food employment with respect to the minimum wage negative? Maybe, maybe not. Does a higher minimum wage decrease young adult employment? Maybe, maybe not. 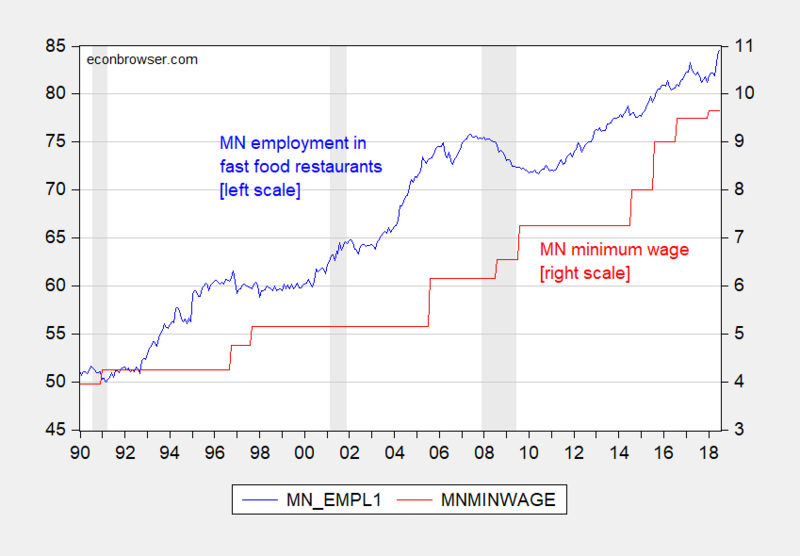 Does a higher minimum wage raise fast food restaurant prices? Not noticeably. These conclusions (reported in this working paper written by Louis Johnston and me) stand in contrast to those obtained by Noah Williams, and reported in this CROWE Policy Brief. If one saw the following battery of graphs provided in the Policy Brief, one could plausibly think the answers to all three questions were unambiguously “yes”. Well, the temptation to do “ocular regressions” is why academic economists do econometrics. …an inference is not believable if it is fragile, if it can be reversed by minor changes in assumptions. 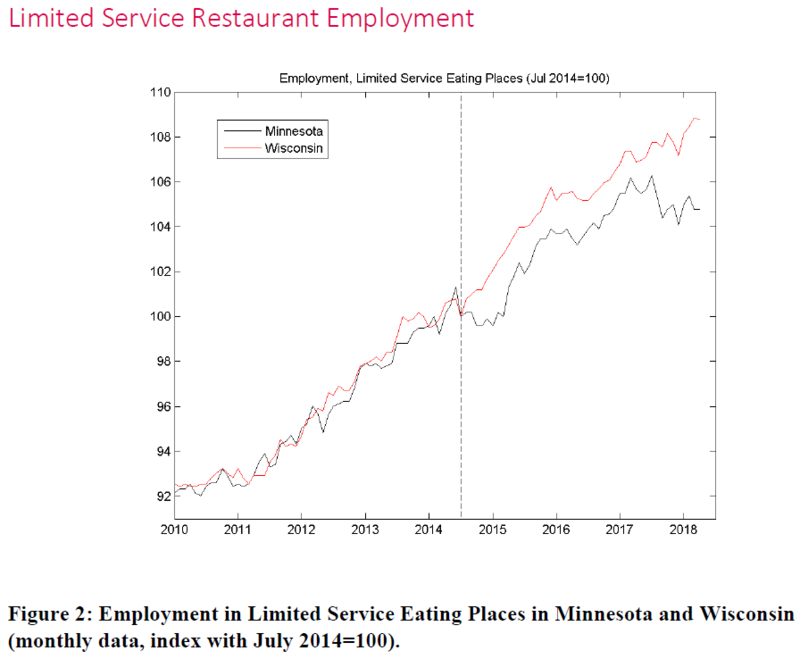 Figure 1: Employment in limited service restaurants, in thousands (blue), and MN minimum wage, in $/hr (red). NBER defined recession dates shaded gray. Source: BLS, NBER, and author’s calculations. In Chinn and Johnston (2018), we express Minnesota variables relative to Wisconsin. 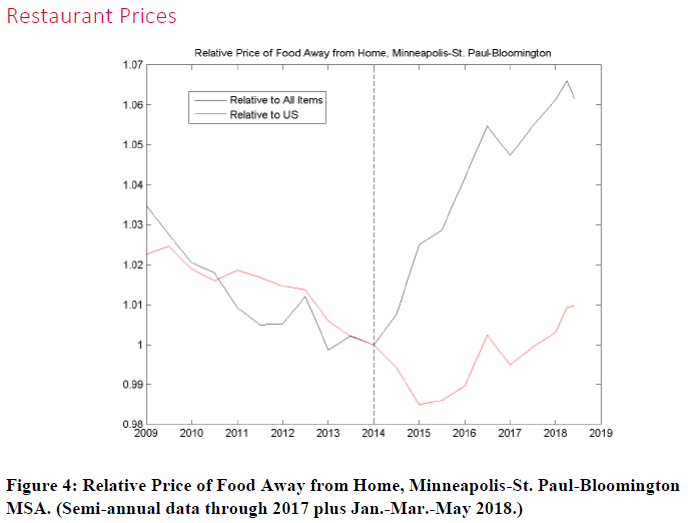 If there is a nationwide trend in, for instance technical efficiency in fast food restaurants, that is common to Wisconsin and Minnesota, then expressing in relative terms partially accounts for this omitted factor. Minimum wage levels are also not random. In particular, states sometimes adjust minimum wages depending on general macro or labor market conditions. 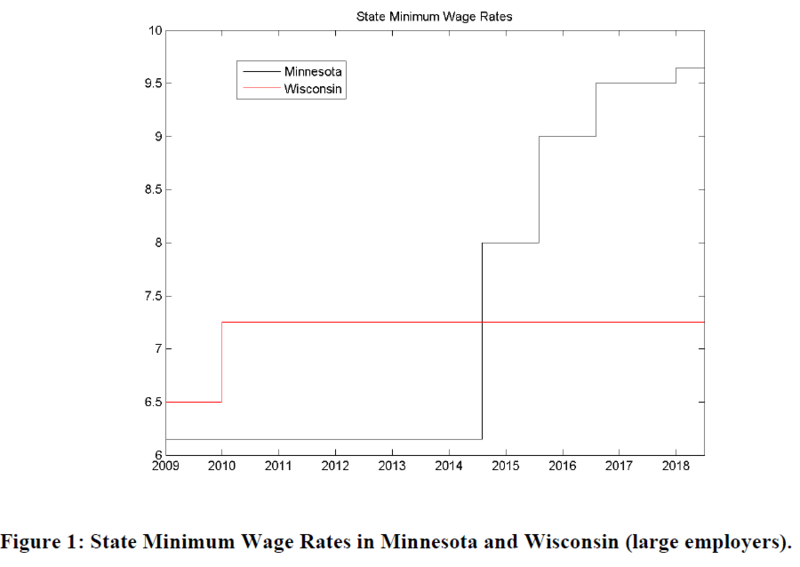 Wisconsin’s failure under Governor Walker and the Republican controlled legislature to raise minimum wages is probably in part due to the lackluster labor market conditions in the state (see here), relative to that in Minnesota. Hence, one might want to control for labor market conditions. For fast food restaurant employment, the opportunities in the rest of the labor market is a potentially omitted variable in Figure 2 (accounting for leads to inconclusive results). For youth employment, total labor force is an implicitly omitted factor in Figure 3. For fast food restaurant costs, trends in the production function are an omitted factor. It turns out that accounting for these factors in regression analyses leads to the answers to the questions posed at the beginning of this post.